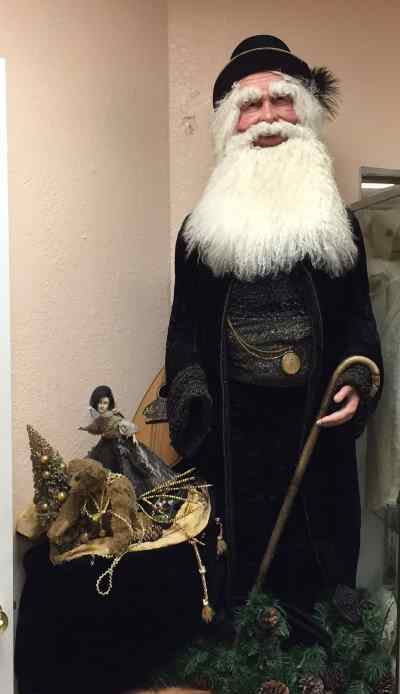 A Russian-costumed Santa Claus by Artists Shellie Robertson and Richard McCall. This over four-foot high Santa was handcrafted in 1995 and is in good condition, given his age, having been displayed at Christmas time in a glass cabinet. When displayed on his wooden box. he is life-sized, and quite a character. "Putting on the Ritz" is a jolly fellow, smiling with dimples, bright blue twinkling eyes. SANTA CLAUS - STONE SOUP Artist Masterpiece One-Of-A-Kind "Putting on the Ritz". 1995 HAND-SIGNED Russian Santa. Stone Soup Santas are individually hand sculpted, so each piece is a unique original creation. "We dedicate ourselves to the unique qualities of Christmas and the inherent joys emanating from the season.". Richard and Shelie McCall began making Santa dolls in 1989 to give as gifts to their friends and thus began the art and passion that today is Stone Soup Santas, where they create magnificent Santa dolls from their home on Mt. Tamalpais in Marin County California. Richard creates the forms: sturdy, freestanding wood-and-metal armatures and Shelie sculpts Santa's polymer-clay head, hands and face. She also creates the costumes with fabrics that have a vintage feel. Stone Soup Santas were the covers of the Christmas Neiman Marcus catalogs for many years. Their Santas have hand-sculpted heads and hands, with stuffed bodies and limbs, and are dressed in vintage clothing and fabrics, with vintage Christmas sacks of toys that Shellie finds at antique shows. Under his sheepskin beard, Ritz is hand signed by the artist, Shellie Robertson and dated 1995. He has a sheepskin mustache and hair. Costuming: Original Russian top hat with feather - velvet material. Russian evening top coat/ opera coat - velvet, which has frogging at the neck, Circa 1920s? Quilted and lined. Back has tassels and more frogging. It has an insert of velvet, insert is golden leaf patterns. Accessories include an Antique walking stick and black suede leather gloves, a fob watch. Body is stuffed and the top is a bodice with beading and sequins, and legs are velvet . Size: over 48 inches tall. 29 inch walking stick 15 x 22 inch sack of toys. Artist Masterpiece One-Of-A-Kind Stone Soup Santa "Putting on the Ritz"